The Chinese, who have one of the world’s oldest civilizations, made the most beautiful and valuable ceramics. Some ceramics were buried in graves and were meant to serve the dead person’s soul forever. Come listen to a loyal subject describe what is respectfully included in his Great Lord’s tomb. It is time now for the living to pay their respects to the dead. The Great Lord, a member of our Chinese Tang royal family, has died. Just as we his loyal subjects have made certain he was comfortable in life, so too we take care of him in the afterlife. We believe that when a person dies, his or her soul lives on in two separate parts: the po and the hun. The po stays with the body in the tomb, while the hun travels off in search of Paradise. It is the nobleman’s po that we try to make feel at home in the tomb. Long ago, when a king or nobleman died, his servants and soldiers were put to death and buried with him. Our ancestors did this because they wanted to make certain that the nobleman’s servants and soldiers would be there to take care of him in the afterlife. Some graves included more than 1,000 bodies and more than a ton of bronze and jade objects. Naturally, a king’s subjects hoped he would live a long and happy life! 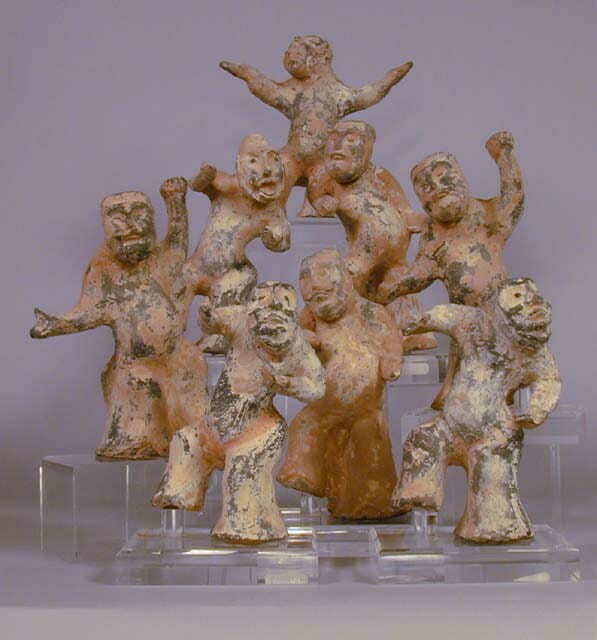 Now, however, we believe that clay objects can substitute for the things the po loved and needed during its lifetime, just as a Han dynasty lord or lady loved these acrobats. They will also impress the other spirits in the afterlife for all eternity and show that our lord was a very important man. The things we include in our Great Lord’s grave show what is important to him and to us as a people. We include many things—mingqi is the Chinese word for “spirit goods” —objects that show that he was wealthy and powerful. The Han emperors ruled a huge land. They set up a centralized government that followed the rules of the philosopher Confucius, who taught that moderation and good behavior are necessary for government officials—just as they are for everyday people. The Han empire had many enemies, however, and continued to build China’s Great Wall to keep invaders out. The first Tang emperor, Li Yuan, later known as Gaozi, added lands to the empire. Under the Tang emperors, China has become known far and wide for its arts. The Chinese empire stretches across many lands. Because of this, we can control trade routes between other countries. Goods made by our people travel as far as the Roman Empire on the Mediterranean Sea, more than 7,000 miles away. How do they get there? Some of them travel across the great Central Asian deserts by camel. 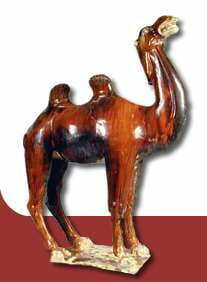 Because our lord was made wealthy through trade, we include a ceramic camel like this one in his grave. 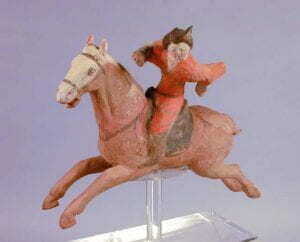 Our Great Lord liked to hunt, and we include clay figures of beautiful and spirited horses in his tomb. 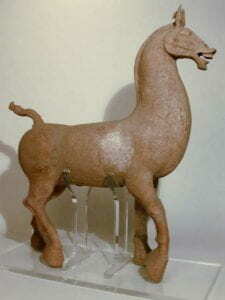 This clay horse stands as tall as a large child, so you can imagine that it took much trouble to make. Horses are important because they help us hunt and they carry soldiers during battles with invaders. One emperor owned more than 400,000 war horses! We believe that there is a kind of horse called the Heavenly Horse. These horses can fly through the air and carry the soul to Paradise. We ride horses in war, at work, and in play. We Chinese learned to play polo from the Persians, and both noblemen and women play this exciting—and sometimes dangerous— game. Riders on horseback hit a ball through the opponent’s goal with mallets, which takes great skill for both the rider and the horse.